Neoprene. Fertilizer. Adhesives. Steel. What does this obscure list of products have in common? In 1893, UNC scientists and North Carolina businessmen discovered an economical process to create this chemical compound and its byproduct acetylene gas. That breakthrough led to the establishment in of the world’s first commercial calcium carbide plant — a North Carolina business that grew into Union Carbide, now owned by Dow Chemical. Although no commercial use was known at the time for the products the team created and validated, their properties were to become the foundation for industrial technologies essential to the development of the modern age. Calcium carbide, manufactured at scale, made possible the production of precision and structural steel required for the armor plating of battleships, the frames of skyscrapers, and the development of high-speed tools and stainless steel. Acetylene — the clear gas produced when calcium carbide is placed in water — made possible oxyacetylene welding and eventually became one of the foundations of the synthetic organic chemicals industry. In 1932, the synthesis of vinyl acetylene led to the development of DuPont’s synthetic rubber, neoprene. 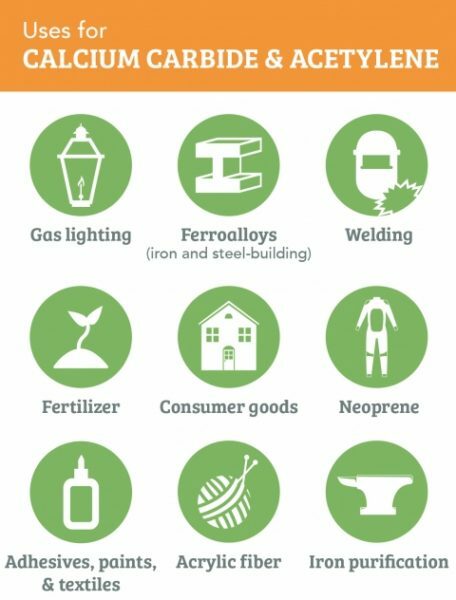 Acetylene today is used in a variety of everyday consumer products, including tableted drugs, sunscreens and lotions, antiseptics, and toothpastes. 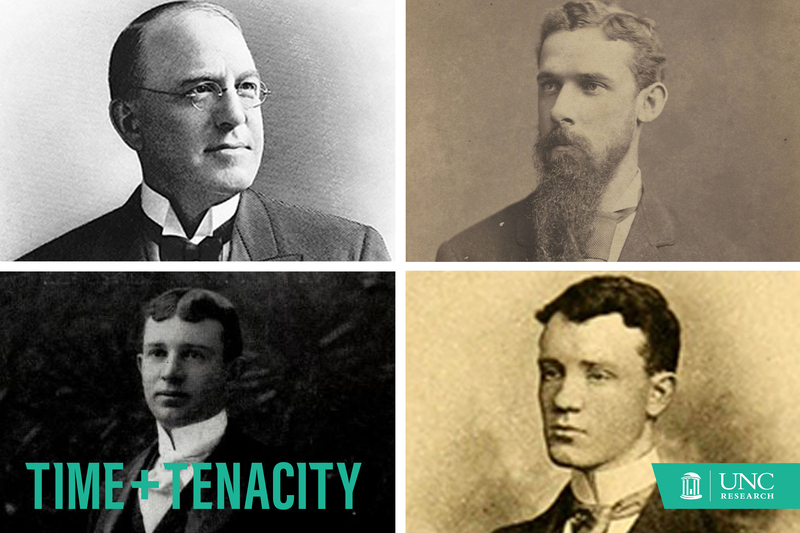 As important as the discovery of a manufacturing process for calcium carbide was to the world, the people who made it possible — James Turner Morehead, John Motley Morehead III, Francis Venable, and William Rand Kenan, Jr. — had an equally profound impact on UNC. Today, their names adorn buildings and programs across the campus — from Morehead Planetarium, to the Kenan Science Library, to Venable Hall. In the 1800s, aluminum was considered a precious metal. In fact, it was a sign of wealth to use aluminum tableware in your home. It was hard to extract from its ore, and scientists struggled to find an inexpensive process to obtain pure aluminum. But when an economical procedure to do exactly that was discovered by a man named Charles Martin Hall in 1886, the country’s chemists took heed. Why? The answer was simple: money and renown. Thomas Willson, a Canadian inventor, wanted to capitalize on Hall’s results by developing an alternative, patentable process for producing aluminum. “I suppose he was trying to get rich quick,” Maurice Bursey, a UNC professor emeritus of chemistry, shares. In 1881, Willson came to North Carolina in search of an “abundant source of power” — high voltage, he felt, would lend him what he needed to secure a new chemical process. He found precisely that at Maj. James Turner Morehead’s cotton mill and hydroelectric plant located in the town of Eden where the Dan and Smith rivers converge. Willson brought his business proposition to Maj. Morehead, who had already been in search of a venture to utilize the excess power created by his hydroelectric plant. Together they formed the Willson Aluminum Company and installed one of the first electric arc furnaces in the country. Maj. Morehead himself lacked chemistry know-how, but he decided his son John — who had just graduated from UNC — should return to the college for one year of graduate work in chemistry. John took all the courses offered by Francis Venable, UNC’s chemistry department chair and professor. “He never presented himself as a candidate for an advanced degree, but learned as much as he could in a year,” Bursey says. “He went back home and became the chief chemical engineer of the Willson Aluminum Company.” Venable became a consultant. John Morehead and Willson were like scientific chefs, throwing all sorts of ingredients into a chemical soup with the hope of producing pure aluminum. One of these ingredients included tar coal because of its carbon properties. In May 1892, while fishing out the result of their experiment, the duo did not find aluminum — but rather a dark, glassy rock. Upon placing their new creation in water, the duo noticed it released a gas they thought to be hydrogen. To learn more about it, John and Willson turned to Venable and his student William Rand Kenan, Jr. They identified the rock as calcium carbide — not unknown at the time. A French chemist previously produced the compound, but only using an involved and expensive chemical process. John and Willson’s new process combined lime (calcium oxide) and tar coal (carbon), both accessible materials. The released gas on the other hand, according to Venable and Kenan, was acetylene. Venable and Kenan persevered and found that, when mixed with air, the gas burned with a bright, clear flame. The scientists felt they had a marketable product. Willson filed for a patent on the chemical process in August 1892. Venable published a paper on the findings (something that would save the company’s patent rights in several lawsuits). Maj. Morehead and Willson struggled to find financiers interested in their patents. Then, when the stock market crashed in May 1893, the Willson Aluminum Company went bankrupt — Maj. Morehead was left penniless. “But gas lighting was very common in the United States during that period,” Bursey says. “And although electricity was developing for home lighting, there still appeared to be a demand for gas.” Acetylene could produce a flame 10 to 12 times brighter than that of coal gas — and that’s what attracted buyers. In January 1894, Maj. Morehead and Willson made their first sale. The New York-based chemical and apparatus supply house Eimer & Amend purchased one ton of calcium carbide. Seven months later, the Electro-Gas Company purchased the entire business, except for the chemical rights to calcium carbide. Willson reserved all the rights for Canada, while Maj. Morehead — after borrowing money — erected the world’s first commercial calcium carbide plant in North Carolina. Maj. Morehead pressed on. He built an even bigger plant in Lynchburg, Virginia, on the James River and, soon after, a second facility in Kanawha Falls, West Virginia. Both facilities contributed greatly to the nation’s iron and steel industries. In the steelmaking process, calcium carbide is used to remove impurities from iron, which improves the quality of the steel. Maj. Morehead’s West Virginia plant produced ferroalloys — combinations of iron and chromium, manganese, or other metals. During the manufacturing process, these metal mixtures are added to steel to increase strength, reduce corrosion, and improve heat resistance. The high temperatures of the carbon-arc furnace used to create calcium carbide also allowed for the melting and combining of these metals, making them an ideal product to produce hand-in-hand with carbide. Maj. Morehead’s plant made the first chromium alloy in the country and the first ferrochrome for armor plate steel, which was used to create armor for the Spanish-American War. Ferroalloys also aided in the production of steel plates for battleships, the frames of skyscrapers, and the development of high-speed tools and stainless steel. In 1898, Peoples Gas Light and Coke Company of Chicago took over Electro-Gas and formed the Union Carbide Company — the nation’s first large-scale chemical manufacturer (known today as the multinational Dow Chemical Company). Maj. Morehead eventually sold his ferroalloy business to the company in 1906, just two years before passing away at the age of 68. John Morehead broke off from the business after the crash of 1893, and went to work for Westinghouse Electric, eventually taking the position of construction engineer for the American Calcium Carbide Interest. In 1899, he invented an apparatus for analyzing gases and wrote an accompanying textbook, “Analysis of Industrial Gases” — both of which were standard components of industrial laboratories for years. In 1902, he moved to Chicago, where he became chief chemist and engineer of tests for Union Carbide. Upon U.S. involvement with World War I in 1917, he volunteered to serve as an army major — even though he was 47 years old — and held positions on various war-time chemical engineering committees. After the war, he moved to Rye, New York, where he became mayor from 1925 to 1930. Then, from 1930 to 1933, he served as the U.S. ambassador to Sweden. John believed he could make his alma mater one of the best universities in the nation, and pursued that dream by founding UNC’s John Motley Morehead Foundation. Hoping to replace the South Building’s dilapidated belfry with an extravagant bell tower, he donated the funds to develop the iconic Morehead-Patterson bell tower — the largest bell of which is engraved with his grandfather’s name — in 1931. Nearly 20 years later, to reinvigorate Chapel Hill, he commissioned the construction of Morehead Planetarium, where every NASA astronaut who journeyed to the moon learned how to navigate the stars. John also developed one of the most prestigious undergraduate scholarships in the nation: the Morehead-Cain Scholarships. Kenan worked for the North Carolina Geological Survey and installed the first electric lighting system in Chapel Hill. The Carbide Manufacturing Company at Niagara Falls hired him as an engineer. He traveled to five continents to help setup plants to produce calcium carbide. Afterward, he completed a short stint working for Union Carbide in Chicago. By 1943, he had been an officer or director of more than 18 companies. To UNC-Chapel Hill he donated the funds for Kenan Stadium (in memory of his parents), the Kenan Chemistry Laboratory, and the University of North Carolina Press. For many years, Kenan was business partners with Florida entrepreneur Henry Flagler, hence the UNC Kenan-Flagler Business School. Venable never reaped the financial benefits of calcium carbide and acetylene — he simply appreciated the science of it all. He occupied the first endowed chair at UNC (the Mary Ann Smith Professorship) and served as president of the university from 1900-1914. Under Venable’s advisement, the university’s financial position strengthened, the graduate and professional schools upgraded, and various departments received national recognition. Upon exiting the presidency, he returned to being chair of the chemistry department and became one of UNC’s first five Kenan professors. “The students loved him,” Bursey says, “and he loved them. He continued teaching until his memory started to fail.” After giving 50 years of service to Carolina, he finally retired in 1930. Today, universities secure patents on discoveries and may negotiate intellectual property rights with industry sponsors. That wasn’t the case in 19th-century America — and would not become the norm until the 1980s. But that hardly means UNC failed to profit from the discoveries of Morehead, Venable, and Kenan. Their dedication to education, research, science, and discovery helped propel America into the industrial age and paid tremendous dividends to both UNC and North Carolina. Walking around campus today, you can’t miss the names of these leaders on many of UNC’s structures. The chemistry department, in particular, resides within three buildings bearing their names: Venable Hall (1925), Kenan Laboratories (1973), and Morehead Laboratories (1987). They are forever a memorial to the events of 1892 and 1893 that changed the world. Maurice Bursey is a professor emeritus of chemistry and taught at UNC-Chapel Hill for 30 years before retiring in 1996. He’s also the author of “Carolina Chemists” (1982) and “Francis Preston Venable of the University of North Carolina” (1989). This entry was posted in Invention, Time and Tenacity. Bookmark the permalink.